Dark Manor Game Review - Download and Play Free Version! Includes a nigh unending supply of hidden object puzzles to play. Furnishing your manor is fun. The Energy meter limits how long you can play. You may have never known it, but it turns out you have an uncanny ability to see and communicate with the dead. The mansion you’ve inherited from your uncle in New Orleans turns out to be haunted. Thankfully, the ghosts aren’t interested in rattling chains at night; they just want out of this prison already. You’ll have to explore the mansion grounds from top to bottom, gathering as much ectoplasm as you can to free the ghosts from their tethers. While you’re at it, see if you can give the place your own personal touch by putting in the best ghostly furnishings money can buy. If you do a good enough job, then you’ll be able to experience a Mardi Gras celebration like no other! 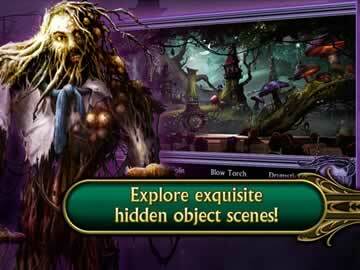 If you want a hidden object game, then you have come to the right place with Dark Manor: A Hidden Object Mystery. It boasts a nigh infinite number of HOGs that can be played as often as needed in order to solve the manor’s many haunted mysteries. Features atmospheric visuals and ambience. Search for items in misty chambers while fading spirits watch your every step and ghostly voices whisper into the wind. Play HOGs in every scene and locale as often as you like. Randomized lists of items will keep you guessing. Pan and zoom the camera around to get a better look at the scene and see the hidden items better. Find items in rapid succession to increase the multiplier on your score. Click the Hint button to get the location of a random item. Just because the mansion is haunted doesn’t mean you have to devote every waking hour to dealing with the ghosts. You can also furnish the place to your liking. Doing so will impress the spirits as well and make them more willing to give you a helping hand down the line. Spruce the place up with your choice of ghostly furniture. Buy a monument, a desecrated coffin, lay down cobblestone paths, and more. Add a little more “unlife” to the place by filling it up with walkers. Walkers can include black cats, ghostly maids, friendly zombies, animated skeletons and more. Purchasing furniture and walkers earns you Juju, which you’ll need to unlock more rooms and features. Determine the placement and layout of all your furnishings to create the mansion in your image. It won’t do to just search the estate grounds blindly. In order to get to the bottom of this mystery properly, you’ll have to turn to the ghostly inhabitants, like the lovely Yvette and Ellensmere, for help in pointing you the right way. Complete missions to earn money and experience. Unlock dozens of achievements to earn extra goodies. Open up more rooms to move the story forward. Spin the wheel after every HOG to get a random bonus reward. Manage your energy levels carefully to make sure you can keep searching efficiently. If the above wasn’t enough to get you excited, then know this: Dark Manor is completely free to play and includes content updates and seasonal events that will keep you coming back for more. If you want to experience a challenging HOG dripping with a lot of atmosphere, then you can’t go wrong exploring the haunted halls of Dark Manor! If you're the type of person who eats hidden object adventure games up like there's no tomorrow, then looking at any of the latest free-to-play ones that have been cropping up may seem like a wise investment. They effectively give you an infinite number of hidden object games (HOGs) to play at potentially no extra cost after all. 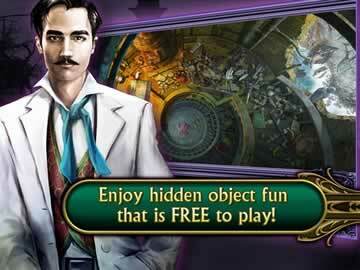 With that in mind, Dark Manor: A Hidden Object Mystery looks like the free-to-play game of choice for the oft-used haunted house setting. A cursory glance will tell you that the production values are through the cobweb-strewn roof. Does the actual gameplay live up to it? In some ways, it provides an adequate and enjoyable scavenger hunt. In others, the business model does everything it can to hinder your enjoyment every step of the way. When you look at the title for Dark Manor, you'll probably wonder why the developers didn't aim for a more original name. Then you'll remember that when it comes to the hidden object adventure genre, the haunted mansion isn't exactly the most original premise anyway. This game has many of the same trappings: an uncle you barely knew dies, you inherit his estate for some reason, and now you have to go through the process of exploring its dank halls while dealing with the ghostly squatters. Fortunately, it works very well despite the cliché. The visuals are absolutely smothered in details that hold up especially well when you zoom in on them. Scenes are meticulously crafted in layers to give the environments a sense of space, and there's a good amount of animation to be found on general screens or in hidden object sequences. It all adds up to make a very atmospheric and vaguely creepy setting. There's also a nicely-sized cast of well-drawn characters to round things out and add more life to the scene, or at least as much as you're going to get in a place stirring with the dead. For what it's worth, Dark Manor also does what it can to mix up the usual haunted house conventions. This isn't just some regular ghost-filled manor; it's a plantation overlooking a Louisiana bayou in the New Orleans area. The architecture, furniture and clothes take their cues from the 1920s, and voodoo magic is flickering in the air. There's a nice amount of humor infused in the package as well, thanks to the bickering ghosts of your deceased uncle's wives. The two never stop trading insults even while they're trying to walk you through the basics of the game, so reading what they have to say is always entertaining. 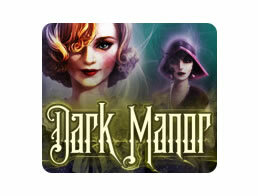 Dark Manor doesn't quite play like your garden variety HOG adventure. While you have a mission to accomplish, the game does not follow a linear narrative. It instead has a more open-ended quest-based system that works akin to an RPG. By speaking to non-player characters, you can accept jobs to find certain items for them in various locations around the manor. Completing the HOG and fetching the item will reward you with money to buy things, experience that opens up new possibilities for you, and other goodies. The idea is that you'll unlock more areas to explore in the mansion little by little and HOG by HOG. For their part, the HOGs are pretty good. Each screen begins with a randomized list of objects you need to find. If you ever have trouble finding something, you can easily press the hint button to reveal the location of an item on the list. In order to maximize your reward for completing the HOG, you need to be able to find many items in rapid order. Therefore, it helps to find multiple objects before you click on them. Overall, there's not much outside the ordinary. However, Dark Manor manages to go against the grain by having most of its HOGs take place on rather large screens. In order to find everything, you may have to pan the scene around or even zoom the camera in close to pick up on things that normally evade the naked eye. This is a very cool feature that makes the whole process feel more involved than usual. It also helps you appreciate just how much detail the artists put into this game even more. Aside from digging around the mansion, you'll have an opportunity to spruce it up as well. You can decorate the grounds with all manner of macabre items, like gravestones, coffins or ivy-choked monuments. You can also opt to lay down your own little cobblestone paths. If that sounds a little lifeless to you, then Dark Manor also lets you populate your haunted house with the usual variety of ghouls and ghosts. These can include zombies, skeletons, black cats and vampires, among others. Putting together your own little haunted house is a fun feature and a worthy addition to the package. It serves a higher purpose too. You need a mystical substance called Juju to unlock new rooms and features in the manor. The only way to get Juju is to generate it from your ghostly furnishings and inhabitants. While this certainly has some issues, it's a creative way to expand your horizons in the game. This brings us to the ugly side of Dark Manor and the price you really have to pay to play it. Everything takes time. If you need Juju to advance, then you need to wait for it to generate. More than that, playing any sort of HOG consumes your energy. When it's gone and you have nothing on hand to restore it, then you only have two options. You either shut down the game to wait for your energy to replenish, or you pay real money to restore it on the spot. If you don't want to burrow a hole into your account, then you'll only be able to enjoy Dark Manor for small snippets of time. Confounding the issue is just how slow-paced Dark Manor is. It will take a very long time for you to open up new scenes to rummage through. In the process of doing that, you'll have to play HOGs in the same few locations over and over again with seemingly no end in sight. While item lists are randomized each time you begin a new game, the actual number of items available for each screen aren't as expansive as they should be. Play enough HOGs on a single screen, and you'll pretty much memorize the appearance and location of all the objects in no time. Combined with the short amounts of playtime you'll be afforded, you'll wonder why you're even bothering anymore. Dark Manor does a whole lot of things right, and a few very big things very wrong. The atmosphere is fantastic, the HOGs are solid, and the home decorating aspect is fun. Unfortunately, there's only so much you can do before things feel repetitive or time runs out. If you're okay with playing for only a few minutes at a time, chances are good that you'll enjoy yourself. If you don't have that kind of patience, then Dark Manor will only frustrate you. Even so, it still might be able to provide an hour or so of free fun on a rainy day.